Miracle Tele is a blockchain-based telecom ecosystem. Our telecom ecosystem is a fully-functioning solution that fuses advanced telco features together with fintech tools. 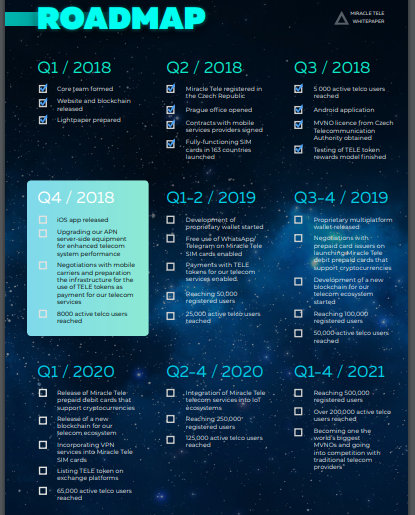 We at Miracle Tele want to grow together with the world and tend to the changing needs of the telecom customers by offering them improved privacy, lack of bureaucracy, reduced rates, and value added services as well as freedom of access to financial tools via blockchain all in one place. Miracle Tele is to set the new standard in the mobile telecommunications industry — so that it becomes more competitive and innovative — and make it possible for the customers to receive rewards thanks to the blockchain technology and collaborative economy. Telecom is considered an industry that provides businesses almost unlimited prospects for introduction of new technologies and reaching steady long-term growth. Historically telecommunication services form a very saturated and monopolistic market where giant corporations forward their own agenda, neglecting the users’ need for a more innovative and technological approach and offering customers services the level of quality of which leaves much to be desired. Currently, most of mobile operators around the world provide their customers only postpaid plans under a 12 or 24 month contract with strict conditions, which often include unlimited national calls and traffic, but still do not offer the clients either cheap international roaming or value added services. In its research called The Future of Mobile Communications, GSMA claims that in the near future the customers will be expecting mobile operators to introduce more and more new features that have to do with advanced communications tools based on Rich Communications Services (RCS) and Voice-over-LTE (VoLTE) technologies. As the technology advances and the world turns more globalized, people don’t look at their mobile phones as simply at a means of communication anymore. And they expect mobile operators to follow the same path by making their processes simpler and more transparent as well as offer additional and more sophisticated services that often have little to do with telecommunications. This way the customers will be able to enjoy reduced rates and cutting-edge value added tools and receive token holder rewards thanks to blockchain technology and collaborative economy. All of this makes Miracle Tele a comprehensive cross-industry product that provides its customers an easy and effective means to use sophisticated communication tools and advanced financial services all in one place, following the global trends for digitalization and decentralization of the most important aspects of our daily lives. An MVNO, standing for mobile virtual network operator, is a provider of wireless telecommunications services either on local, international, or worldwide scale. As a rule, MVN operators offer its customers the same telecom services as conventional mobile operators with a global presence—such as national and international calls, mobile Internet, texting services, and so on—but their internal workflows and business models are entirely different. First of all, mobile virtual network operators do not usually have their proprietary telecommunications infrastructure and instead of it they sign agreements with traditional local mobile operators on bulk purchase of airtime and traffic for its further redistribution among clients. This ensures that the quality of service remains on the same high level and the telecom rates get significantly lower, whilst the customer support performance is usually much better due to a smaller size of the company and stronger commitment of its support department specialists that tend to adopt a tailored approach for every client, resulting in higher customer satisfaction. Secondly, since MVN operators usually start small and have little to no competition on the markets they work, it allows them to have reduced randing and marketing costs, letting them become even more cost-efficient and bring the telecom rates down even further. Apart from it, since MVNOs are not direct providers of airtime and traffic, it allows them to get rid of bureaucracy that is commonly associated with large mobile service providers that require their customers to sign strict and long-term contracts and sell their SIM cards only to those clients who can provide their ID. And this is exactly why Miracle Tele decided to choose this model as a foundation for its Ethereum based blockchain grid that will allow to eploy a wide array of decentralized value added services and tools which will bring the necessary innovation, security, and competitiveness to the mobile operator market, becoming a role model for the future of the telecommunications industry. Miracle Tele is founded and officially registered in the Czech Republic as Miracle Tele s.r.o. (company registration number: 06968287) and successfully obtained an MVNO licence from the Czech Communication Office in July 2018. Telecommunication services are the core product of Miracle Tele. 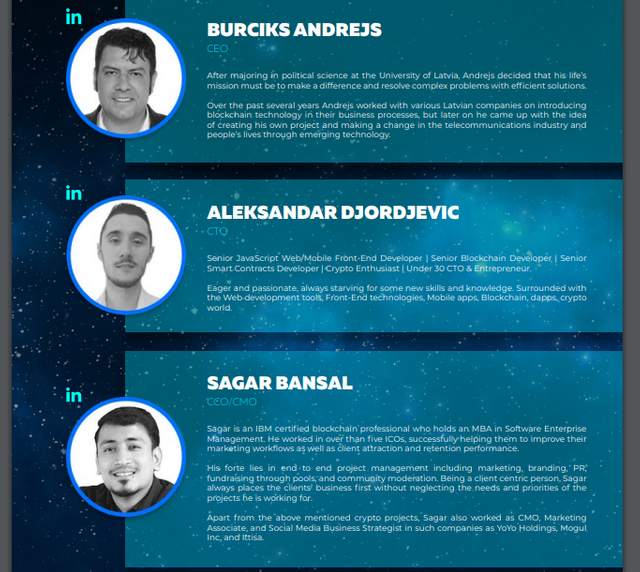 Serving as the foundation for our blockchain grid, they make it possible for the token holders to receive biweekly rewards, giving our project a business advantage over most mobile operators and MVNOs who do not offer their customers decent loyalty or cashback programs as well as over other ICO projects who do not yet have a readily available product that the clients can use. As a Mobile Virtual Network Operator or MVNO, Miracle TELE has no infrastructure development, equipment maintenance, branding, or staff costs. Miracle TELE offer only the most essential telecom services like calls and Internet, making their operations so much more cost-efficient. However, many value-added services are in the pipeline. The absence of operating costs and tokenization of the assets allows Miracle TELE to provide users with a sustainable revenue sharing model. This is what makes it hugely attractive,as well. Miracle Tele shall issue 300,000,000 TELE tokens throughout the duration of Miracle Tele token sale. The Purchaser may acquire TELE tokens from the Company by transferring the Company the corresponding payment in fiat currencies (EUR,USD) or cryptocurrencies (BTC,ETH) as per instructions presented in the member’s area on the Website of Miracle Tele.